Forum » Vehicles » Bikes / ATV / Side-by-Sides / UTV » Polaris first to actually sell "airless tires"
Polaris first to actually sell "airless tires"
goes on sale next month. the "tweel" concept has been around for a while, but this will be the first commercial production of them. also notice this Polaris is an H.O. model and has a little excocage... sweet! can't wait to hear how well it actually works. i'm skeptical if you'll ever seen them on our type of 4x4's as there's no way to adjust them to be more flexy/soft off-road and then put them back to firmer for on-road handling. there's also no sidewall to flex out and help grip trail obstacles. still an interesting concept, glad to see it's moving forward. 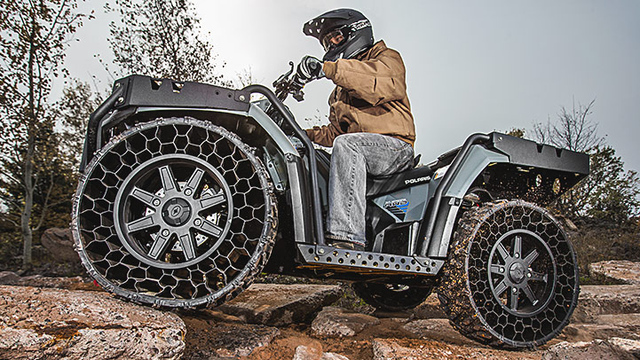 Re: Polaris first to actually sell "airless tires"
It seems like using them on dirt roads or trails would be a bad application for the concept since you could get rocks and other debris in the honeycomb holes. Course, maybe that wouldn't hurt anything? interesting point D, i had thought of that - but i do wonder if smaller gravel would "clog up" the pockets? if it did, then you would certainly loose tire flex and gain a bunch of weight! i've been wondering if the hard edges of the tires would dig up dirt trails more leading to worse erosion or deeper ruts? a normal tire "rounds out" where the tread meets the sidewall, but these have square edges. what if you need to run a "softer" pressure with those, there is no chance of that. atleast if you use there on a truck or suv and wheel it.